Fat grafting is a minimally invasive procedure that restores the youthful volume and contour to the eyes and face. Our face is made of fat compartments that are responsible for its shape and contour. As we age, we lose some of this fat and as a result our faces become deflated and loose projection. Volume loss is one of the stigmata of facial aging and it affects several areas of the face. Areas where the facial volume and fat dissipates include: Cheek, Temple, area around the eyes, area around the mouth, and Jaw line. To correct this volume loss, fat is harvested from other areas in the body, most commonly the abdomen or thighs and is injected through very small cannulas. This is done in small volumes in very specific areas of the face to enhance the natural curves and smooth the uneven and depressed surfaces. Areas that usually benefit from added volume for enhanced projection include the brows and the cheek. This is very clearly shown in the picture below where adding fat to the brow and cheeks produced a lift and desired fullness in the brows and improved the projection in the cheek. In addition to enhanced projection and elevation of soft tissue, fat grafting blends in the facial surfaces and make them smoother. Fat grafting smooths the transition between the eye and the cheek and between the jaw and the area around the mouth. Fat grafting alone can be done under local anesthesia as an office based procedure with little down time. Many times, however, it is combined with a face lift or blepharoplasty and may require longer period of recovery. 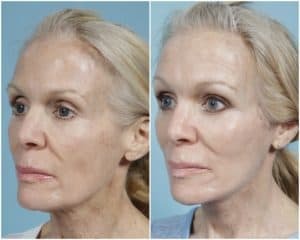 I perform fat grafting with almost all my facelifts and blepharoplasties as it enhances the results of both procedures. This entry was posted in Fat Grafting. Bookmark the permalink. ← When Is Eyelid Surgery Medically Necessary?